The reaction to a Congressional Budget Office report released Tuesday demonstrated how easily politicians are able to game the media system. I want to emphasize that that reduction doesn’t mean that that many people precisely will choose to leave the labor force. We think that some people will chose to work fewer hours. Other people will choose to leave the labor force. Of course, that didn’t stop Republican opponents from claiming that the CBO report proves the ACA is a job-killer. And why not? The media are so quick to go along. Let’s consider that this is Elmendorf’s report, and he said at a news conference precisely what it meant. Yet the very NPR story in which his remarks are quoted is headlined “Is Obamacare A Job Killer? New Estimates Suggest It Might Be.” Gah. This morning I looked at the front pages of four major dailies. Here’s how they stack up, in order of disingenuousness. 1. The Boston Globe. 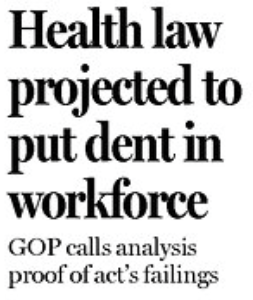 “Health law projected to put a dent in workforce; GOP calls analysis proof of act’s failings.” The clear impression is that people are going to lose their jobs because of the ACA. If you would like to believe that, go right ahead — but it’s not what the CBO said. The Globe headline is slapped atop a New York Times story (below) that isn’t nearly that bad. 2. The New York Times. 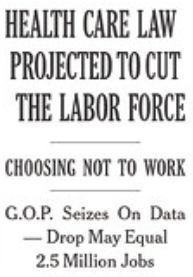 “Health Care Law Projected to Cut the Labor Force; Choosing Not to Work; G.O.P. Seizes On Data — Drop May Equal 2.5 Million Jobs.” Whew! Try saying it all without taking a breath. The Times’ headlines is slightly better than the Globe’s: the second deck, “Choosing Not to Work,” gets at the gist of the CBO report. But the rest of it makes it sound like Tuesday was a very bad day for the ACA. You’ve got to read the story to find out what’s really going on. 3. The Washington Post. 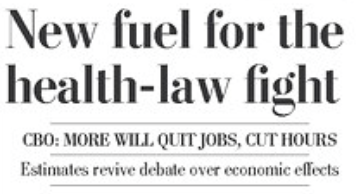 “New fuel for the health-law fight; CBO: More will quit jobs, cut hours; Estimates revive debate over economic effects.” Not bad. The impression given by the headline is that the fight is over the economic effect of people quitting their jobs. Not quite right, but we’re getting closer. Here’s the story. Journalists need to resist the urge. Media Nation: 1, Headline writers: 0. I thought this would be Jon Keller’s topic this morning, and he may still get to it. I wonder what he will say.